MXQ-4K, the first Android TV box based on Rockchip RK3229 I received, was a massive disappointment to me as it was unusable to play 4K videos possibly due to CPU throttling and/or poorly optimized USB storage support. So I was eager to try another device based on the latest Rockchip media processor with support for 4K 10-bit H.265 and H.264 video playback, and Zidoo sent their Zidoo X1 II TV box for review on CNX Software. Today, I’ll start by checking the device and the hardware, before testing the firmware later on. I got the device by DHL in the usual Zidoo’s white and green package with some icons representing the key features: 4K, 3D, ZIUI user interface, WiFI, 10-bit HEVC… ZDMC is the custom version of Kodi developed by the company, and that makes Zidoo one of the rare companies to respect Kodi’s trademark. 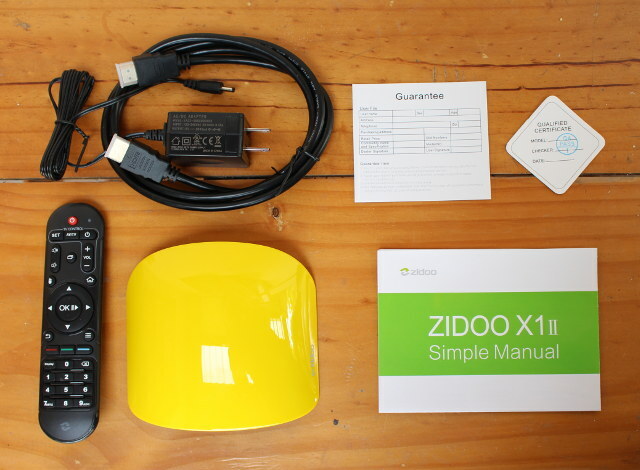 The package includes the yellow version of the device, an HDMI cable, an IR remote control with IR learning function, a 5V/2A power supply with retractable prongs, Zidoo X1 II “simple manual”, a guarantee card, and a “qualified certificate”. 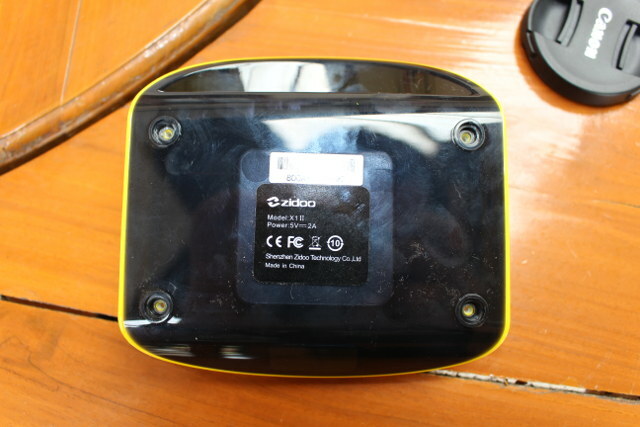 While I found the gray version of Zidoo X1 to be pretty nice and a new refreshing design, I don’t quite have the same feeling with the yellow color used with Zidoo X1 II, as it looks like a hard hat, a flying saucer, and maybe something else depending on the angle. All ports are located at the back with a 3.5mm AV jack, HDMI 2.0 output, one USB port, an Ethernet port, another USB port, a micro SD slot, and the DC jack. 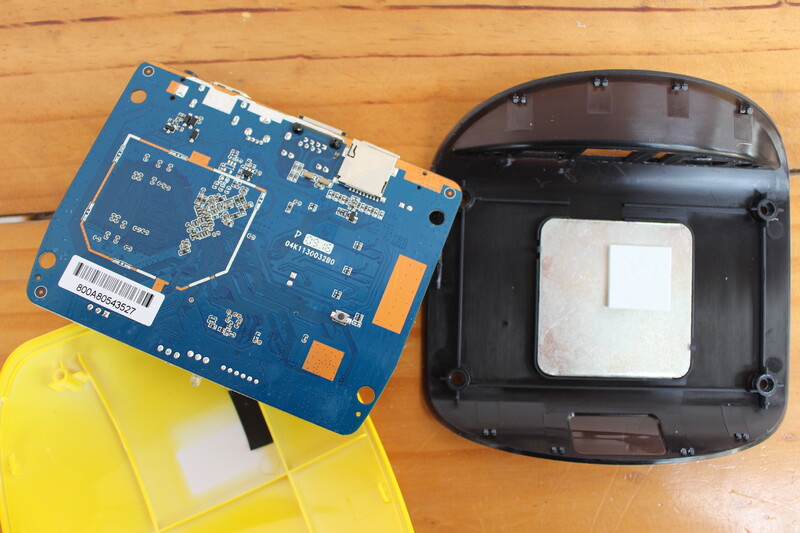 You’ll need to remove the four rubbed pads and loosen four screws on the bottom of the case , and then use a sharp and rigid plastic tool to open the device by separating the yellow and black parts of the case. When I first saw the heatsink, I felt it was not a good sign, as it was quite smaller than in MXQ-4K. 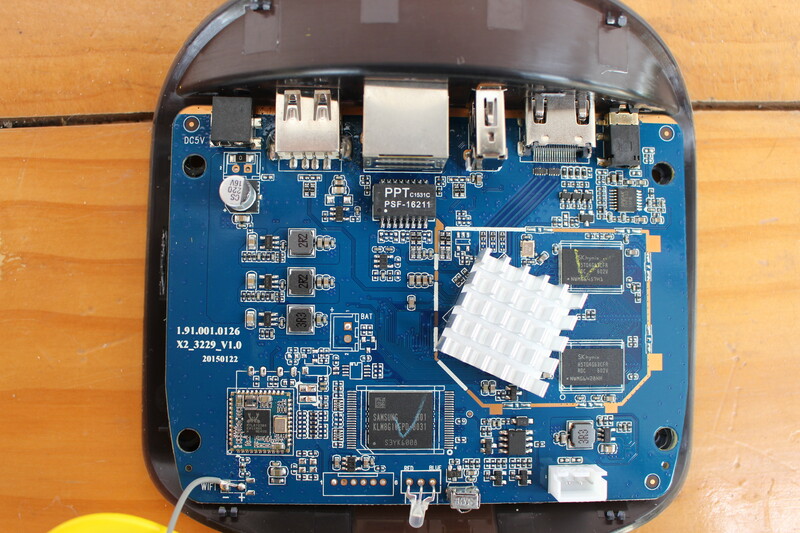 They must have planned to call the device Zidoo X2, as the board is named X2_3229_V1.0, but reverted to Zidoo X1 II as they used the same enclosure as the first design. Two SKHynix H5TQ4G63CFR DDR3 chips and Samsung KLM8G1WEPD-B031 eMMC 5.0 flash are used to bring 1GB RAM and 8GB storage to the device, while a Realtek RTL8723BS module adds WiFi 802.11 b/g/n ad Bluetooth 4.0 connectivity. Since RK3229 SoC is highly integrated there aren’t many other IC on the board, with PPT C1531C Fast Ethernet magnetics transformer, and 3PEAK TPF632 audio line driver. If you plan on hacking the board the 3-pin UART header is soldered which should make it extra easy to access the serial console. There’s nothing much on the other side of the board, except the micro SD card slot and recovery button, but more importantly a thermal pad and metal plate are attached to the bottom of the case to further cool the processor. Distributors and resellers interested in this product can purchase it in quantities by contacting Zidoo directly, for example via the product page. 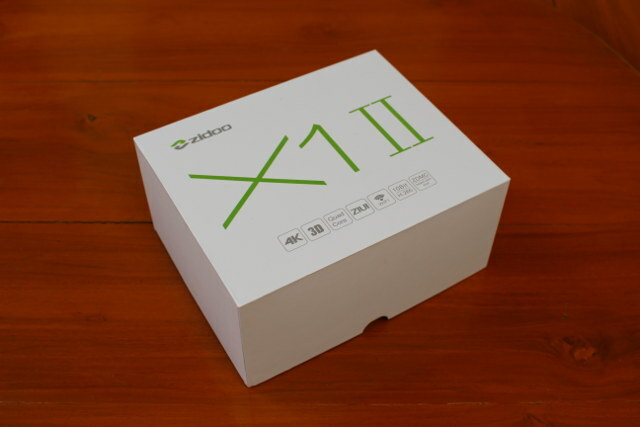 Zidoo X1 II can also be purchased for $49 on GeekBuying, Banggood, or Aliexpress. One more from Zidoo? Why this guys first dont fix issues in existing products and then move to new platforma? The small heatsink is on top of the board. The large chunk of metal and thermal pad combo is touching the bottom of the board, right under the processor. There’s no direct connection between the heatsink and the thermal pad. Any chance to install Linux (Picuntu or Linuxium) on this Android TV box? I’ve seen people started to play with MXQ-4K on rockchip-linux IRC channels. Thanks I will look for some info. Is there any posibility to be compatible this box’s firmware with te MXQ-4K? I was thinking of buying the MXQ-4k at first because it was really cheap. But I suspect firmware support will be nonexistent so I opted for the Zidoo X1-II which is 65% higher in price for similar specs, but with a decent track record of releasing updated firmware. I was choosing between this and X5 (with the more common and tested S905 chipset), but I was taken by RK3229’s promise of better H265 and VP9 support. So I held my breath and took the plunge to get the X1-II. Been rather impressed with it so far. 4K H264, 4K H265 and 4K VP9 videos ran really well. Except that 10-bit videos has noticeable judder every 20secs or so, but still watchable. Hopefully it’ll be fixed with the next firmware upgrade. By the way, all 4K videos I tested is with the stock media player. It runs terribly in ZDMC (Kodi fork). But wait, I didn’t answer your question. I wouldn’t try that if I were you, or risk bricking the device. I don’t think MXQ-4k and X1-II uses the same components although similar specs. Which VP9 sample did you play? I’m using phfx_4KHD_VP9TestFootage.webm (4K @ 25 fps), but it won’t play at all and skip to the next sample in Media Player. Same issue after downloading VP9 videos @ 30 fps directly from YouTube.